Having a summer camp for girls, doesn't just last through the summer, and so recently I found myself driving some high school aged girls to a camp wedding. As the chatting began I heard my wife ask one of the girls how school was going. The girl’s response was overwhelmingly positive. She praised the teachers, praised the assignments; she had nothing negative to say. Impressed with what I was hearing, I turned to my wife and mentioned that in light of this incredible response, we know where our daughters will be attending school some day! Rabbi Boruch Chait inspiring our teenagers with music. When my wife questioned the second girl, the response was almost exactly the opposite. The teachers didn't know what they were talking about, the curriculum was stupid and so on. At that point I again looked at my wife and said, “...and that's one school our daughter won’t be attending.” My wife then shocked me by letting me know that they are both in the same school. I responded how some teachers were just so much better than others. Again I was wrong when she informed me they were both in the same class! So what was going on here? These were two great kids. Different personalities, yet both excel at what they do. What's seems so contradictory is really quite simple, in parsha's toldos Rav Hirsch enlightens us to a major malfunction in the educational system. Yes, the school and teachers were doing an excellent job, but only for one part of the students. 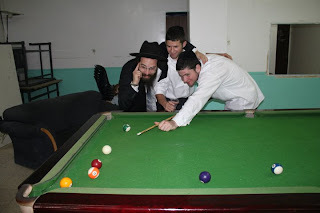 Recreational time with Rabbi Adelman. The answer, Rav Hirsch explains, is in the words of the pasuk “When the lads grew up, Esav was a man who understood hunting. He was a man of the ﬁeld, and Jacob was a single-minded man in his quest for moral perfection, living in tents.” Only AFTER the twins had grown up did Esav become a hunter and a man of the ﬁeld while Jacob became a man bent on spiritual development and inner perfection. So often that I see that the teenagers that have tremendous talent are being cast away, simply because they don’t fit into the ideal model of their school. Some of these students excel at grades, and others have great things to offer, but they are not recognized for that. It’s almost as if we are denying them the Torah lifestyle, or at least telling them that their personalities contradict the Torah, when that is blatantly not true. The most common complaint I hear from teens is that their school doesn’t accept them for who they are. I printed such a letter from a fantastic girl, but she speaks for so many more. 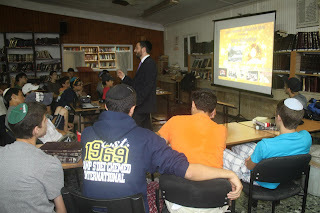 TorahLive.co.il presentation to our boys by Dan Roth. There is a quote from Reb Yaakov Kaminetsky that says “Every yeshivah is to some extent a S’dom bed — cutting each bochur to the shape of the particular institution in which he finds himself.” When a Yeshiva doesn't have the kind of students they want they go through a “crisis”. How often do we hear of a yeshiva that is going through a change, ridding itself of their talmidim and bringing in a new crowd. They are looking to change their name. But is that what chinuch is about, the name of the institution? Why don't we take the students Hashem gave us and work as best as we can with them. We need to remember the words of Shlomo Hamelech “Chanoch le'naar al pi darko”. This R' Hirsch says is the golden rule of education of which the Torah requires of us. A parent that sees their own child turning out different than they imagined or expected can sometimes fall into the same trap. Instead, we have to evaluate each child and see where his/her strengths are and then equip and train them early for that which they will practice when they have outgrown our guidance. Whether it’s the path we envisioned for them or not. It seems that Yaakov Aveinu was well aware of this when he gave the brachos to his children. Instead of blessing them all to grow up and be talmidei chachamim, like we do, he looked at the character traits and blessed each one in accordance with them. We need to do the same, to look at each child and prepare them for what their journey will bring. Read the words carefully “teach them according to their future path” not ours! We shouldn't focus on changing our kids but working with them. Only then will they all grow up and live a true Torah life. Summer camp has the added advantage of being a place where kids can express themselves in so many ways. I am always amazed that my staff can form such strong bonds even with the toughest of campers. I think it’s in part because no one handed over the child’s life plans to the counselors and in part because there was no room in the suitcase for the mold they were cast into outside of camp. It’s time we broke the mold. If you read this article on another website, please comment on my blog so I can respond. This is so head on...You need to start your own sdei cheme school! Many schools are beginning to explore online learning as a way of differentiating. This is so on the mark. Just a little more than 24 hours ago a friend was talking to me about a school that we think is working very well for one of our children. She and her child are having a very different experience. The school has decided that this student doesn't fit the mold and thats that. Now, she said, "We're counting the days," until the child is done with the school. A smart person runs that school but, really, that person should feel ashamed. Because that's shameful. Online learning can help with weaker and stronger students but it won't help a child that doesn't fit in. This article should be required reading for all individuals involved with Chinuch. I understand that being a Rebbe or teacher is very challenging, but most Institutions of Jewish Study have either forgotten, or never knew the concept of Al Pi Darcho. Yeshivos must adjust their educational models to instill and enhance the love of Judaism and Torah in our children. Thank you for continuing your phenomenal posts! I know differentiated education is all the rage these days, but it takes a qualified, experienced teacher to truly differentiate. I'm wondering the thoughts of others out there on tracking in schools, especially in light of this parsha. Also, I think its obvious the boys weren't given the same upbringing, as Yitzchak gravitated toward Esau while Rivkah gravitated toward Yaakov, and that's pshat even. I'm not sure what you mean by your sure they weren't given the same upbringing with regard to education. This is what Chazal say, not me. About Rivka and Yitzchok gravitating to different children is something Rav Hirsch also mentions as a major problem in their upbringing. I'm not sure Chazal said this. RSRH said it. He gets it from the words "V'Yigdlu Han'arim" which he takes to mean that grew up in the same manner. moved into the house of study and the other into the house of idolatry." I see someone scanned a copy of it, so here is the link. I enjoyed this and got a lot out of it and will share it with my kids.Meantime please have all of us in Eretz Yisroel in your tefillot now- we need it. Shabbat shalom. May we have the peace we seek. That was a really wonderful post! Our daughter asked my husband and me FOUR times over the past few days if we had read it. With that kind of PR how could we not?! As a long-time homeschooling family (for only those of our kids for whom it is the right path....) I would like to suggest that people make sure to consider homeschooling as an option. As someone who has a lot of trouble learning using the typical Jewish education model, this D’var Torah for last week’s parsha really resonated with me. Definitely recommended reading for anyone who is currently attending or ever has attended school! Great blog you have going there. Keep up the good work. Ah yes! Forgot about that. It's R' Levi that gets it from the words "V'Yigdlu Han'arim" - understanding that to mean that they were raised the same way, in the same school. Molds and mildews undergo various phases during their life cycles and lead to serious health problems in human. Certain preventive steps can stop mold growth inside homes and office premises.